Season seven of The Walking Dead has been a tough one for Rosita. After losing former partner Abraham in the most brutal fashion, she’s become obsessed with revenge and even attempted to assassinate Negan when he visited Alexandria. It’s been exciting to see Rosita pushed to the forefront this season. What has that been like for you? I was really excited to have more of who she was relayed to the audience. I feel like she’s been a little mysterious and now you’re getting to see more of who she is as an individual – how things affect her [and] how loss affects her. That’s what we’re witnessing right now – how trauma and loss have affected her. None of [the group] are handling it well but she, in particular, is handling it in a very passionate way. She’s almost getting destructive. How much of what Rosita’s done this season has happened entirely because of Abraham’s death? I think the majority – that was the catalyst, you know? I think it’s all stemming from her loss of Abraham. I think that’s the straw that broke the camel’s back. 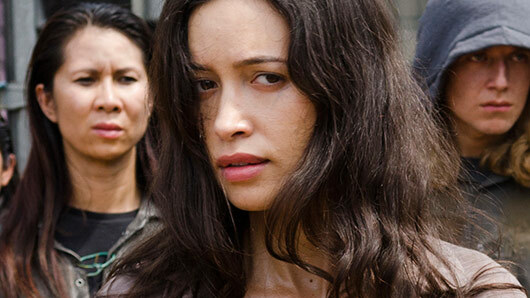 Who do you think Rosita is closest to in Alexandria? I think they’re a family and that goes without saying. 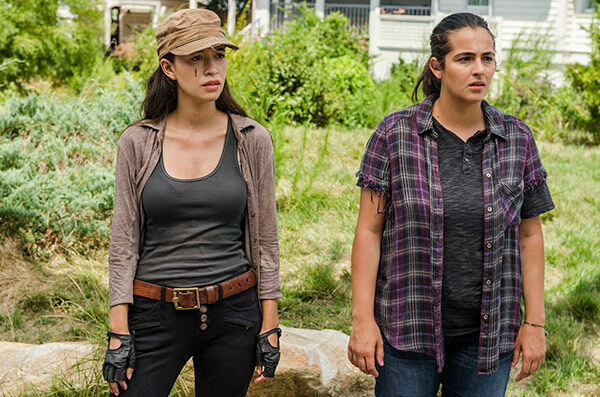 Rosita and Sasha are a family, but you don’t get along with all your family members all at the same time. When you go through things, especially as great a thing as they went through, [you act] out different ways. That’s what’s interesting about the show, you’re seeing everyone react very very differently. I don’t think it’s because she doesn’t care for anyone she’s with – they’re still family – I think it’s just because this is a moment that she’s going through. Are there any other characters you would like to spend more scenes with in the future? 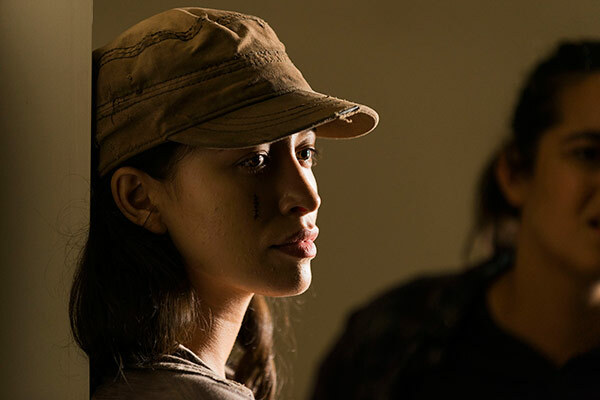 We are seeing a little tension between Sasha and Rosita so I think maybe they’ll have to spend time together. I feel like I’ve gotten a fair share of time with everyone at this point and I feel very lucky to have had that because a lot of the time the show can segregate characters. All I can tell you is that what we strive to continue doing is topping ourselves. We always want to make a bigger episode, a grander episode, a badder episode and a rawer one, honest, more thrill-seeking and I think we’re succeeding. I think that’s why people sometimes get shocked or sad. I don’t necessarily agree with all the character choices, or deaths, or survivals – but that’s what keeps the show interesting. I think that’s what keeps people coming back. I’m a fan of the show. I still enjoy watching it and I love seeing the deaths of some of my favourite characters because I can acknowledge that while I don’t get to see my friend every day – that’s terrible – it makes for really good television. I think that people are going to be satisfied with the amount of television they get for the finale. I don’t know if they’ll agree with everything but I know they’ll be satisfied. Does it take a long time to recover from making the show? It does. It depends on the scene but a lot of times we have to recover physically. We not only get things like exhaustion and dehydration, which are the two most severe things on set, but cuts and bruises and bug bites that get infected and trips to the hospital because all of us are so into what we do. We have so much fun doing it and sometimes we don’t know when to stop, which gets us into trouble and hurts sometimes. I think that’s another reason why the show is so good because it’s all real and genuine. When you’re seeing us looking tired and exhausted and like we’re about to throw up from running it’s because we’re about to throw up from running. We didn’t want to say we need a break. We wait until they call cut and then scream for the medic. Do the female members of the cast get recognised less outside of the show because they have the advantage of make-up? That is the disadvantage actually because a lot of the time when actors and actresses especially want to be incognito they throw on a hat and a hoodie, but that is exactly how you will recognise any of us. So almost to avoid getting recognised we have to doll ourselves up, which can be really time consuming and obnoxious. There is something there. I don’t think it’s that the women are recognised less, I think that people are less inclined to approach some of the women on the show. I think the men are maybe a bit more personable for strangers or seem more approachable. Are you a lot like Rosita in real life? Oh yeah. In some ways, we’re the same person. A lot of her attributes are of course something that exude naturally from me [laughs]. She’s a lot more brave than I am. I want to say she’s more stubborn than I am, but that would be a lie. I think I’m just as stubborn as she is. I’m just as smart and beautiful as she is [laughs]. If you could give her any advice right now with what she’s dealing with, what would you say to her? Time. I think the character just needs time. I don’t know. I joke and say that I would be protecting everyone and that I would make it and I’d be good, but I probably wouldn’t. I’d have a panic attack somewhere and lock myself in a room. I don’t think I’d get very far. Is there anyone in the cast who you think would do quite well? Seth [Gilliam, who plays Father Gabriel]. Seth would find a way, absolutely. I think Seth as an individual is wild and crazy and I wouldn’t put anything past him. He would make a weapon out of silly putty.